I’ve always loved the idea behind the PowerBook Duo system, so much I think it could still be handy today without feeling obsolete. (Today we have notebook computers that can transform into tablets, no? So the concept still stands). I was really happy back in 2000 when I acquired a full Duo system consisting of a PowerBook Duo 280c, Duo MiniDock, the DuoDock II, a 14-inch Apple colour display, and an AppleDesign keyboard plus ADB mouse II. I remember using this system rather frequently in the 3-4 years following the acquisition and before purchasing a second-hand clamshell iBook G3/466. I had a battery for that Duo with enough juice to last me about a couple of hours, so I could use the Duo 280c while commuting, then recharge it while I was at the university, then more writing on the train back home and, once home, I would insert the Duo in its Dock and continue where I left off, but on a bigger display and with a full-sized keyboard. Then the problems started. One day, after a power surge, the DuoDock II power supply died. At the time I didn’t have the options I would have today if I wanted to search for a replacement. At a local shop and Apple reseller they told me they could import the part, but when they gave me an estimate of the final price, I decided it was not worth the trouble. From then on, I would use the Duo MiniDock instead. The loss of the DuoDock meant having to extract the internal hard drive (that was bigger in storage size than the 230 MB internal one of the Duo 280c) and put it in an external SCSI enclosure. Not being able to use the DuoDock floppy drive was another loss, as it was one of the most reliable units I had ever used. 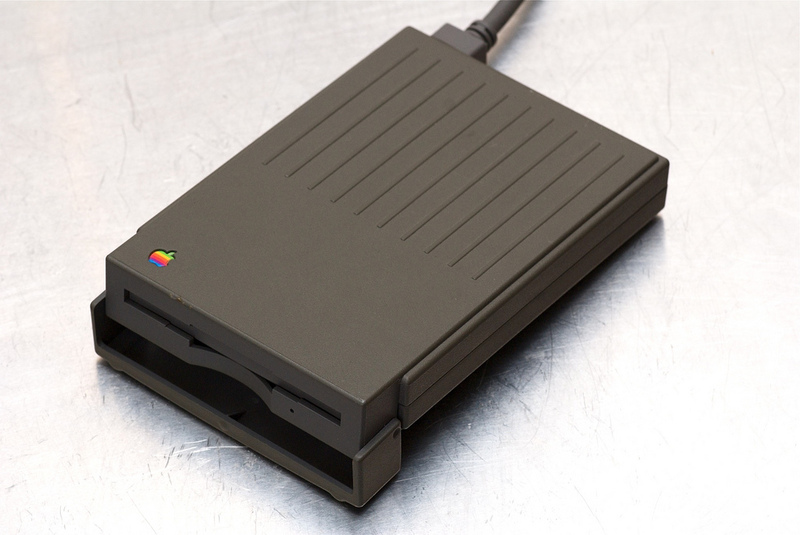 Luckily I still managed to handle floppies by connecting the external floppy drive of my PowerBook 100 [image source]. I also lost Ethernet connectivity (the Duo MiniDock doesn’t have an Ethernet port), but since it was mainly used for transferring files locally, I switched to LocalTalk; slower, but better than nothing. I was still able to use the Duo in desktop configuration by connecting the 14-inch display and the AppleDesign keyboard via the MiniDock. Then the problems continued: the display stopped working, but I had another available from another acquisition; but then of course the DB15 cable broke down. At that point I didn’t have much time to take care of what appeared to be a streak of Duo-related bad luck, so I just used the main Duo 280c unit when out and about, because it was still the lightest, most compact option for writing when not at home. Fast forward to late 2014: one day, for no apparent reason, the Duo 280c stopped working. By that time, my vintage Mac collection had grown, and I had other machines readily available to keep carrying out the tasks I used the Duo for. But no other portable Mac was that compact and lightweight. Losing the PowerBook Duo 280c was a blow. Imagine my joy when a very generous donor contacted me and sent me — among many other things — a complete Duo workstation with another 280c unit that was even better configured than mine (more RAM, more storage space). For a while, I enjoyed having such a workstation on my desk again. It was a bit like going back to those years when I was making the most out of it. Unfortunately, the power supply in that newer DuoDock II died shortly after. That generous donor was awesome enough to send me another power supply — which lasted for about three months. Both power supply units showed the dreaded ‘tick of death’. Fast forward to three days ago. I’ve now moved to another apartment, and after finally settling down, I’m doing a general check-up of all my vintage machines. I plug in the Duo, and it doesn’t boot. Since everything was working seven weeks before, the first thing I thought was that I had to reset the Power Manager. I followed the instructions, but to no avail. The Duo still didn’t boot. This useful article on TidBITS reminded me to try the trick of disconnecting the internal backup battery and perform a full Power Manager reset. Nothing. The Duo wasn’t showing any sign of life. Now, if there’s one thing I’ve learnt after 30+ years of dealing with computers and related accessories is that everything can just stop working out of the blue, no matter its apparent reliability — and so I thought: what if the Duo’s AC power adapter is the culprit? Regrettably, I don’t have the necessary tools to test whether an adapter is working or not, so the only empirical test I could perform was to connect another adapter and see whether the Duo booted. The only viable candidate was the Macintosh PowerBook 45W AC adapter I use with my PowerBook 1400c. The connector is the same, but since it’s a more powerful adapter than the M2693 that came standard with the Duo, I was hesitant about connecting it right away. Checking the specifications, it appears that both adapters feed 24 Volts to the computer, but the slight difference in amperage (1.5A for the original Duo adapter, 1.875A for the 45W AC adapter) got me concerned. So I asked for advice on Twitter and other social networks. Thomas Brand chimed in and suggested that, provided the two adapters feed the same voltage and have the same polarity, there was no harm in connecting the 45W AC adapter to the Duo. Given his extensive experience, I trusted him and proceeded with the test. I apologise if it took me so long to get to the point of this post. I wanted to offer a good amount of context to explain how sad I felt when even this second Duo 280c unit appeared to be dead. I decided to write about this because perhaps there are other vintage Mac enthusiasts out there who encountered a similar situation and asked themselves: Could I just switch adapters? Will this other one work? In this case the swap worked. The general advice is: pay attention to the AC adapter’s specifications, and to the things Thomas Brand mentioned above. And be wary of third-party adapters, especially if they came cheap and from ‘unknown’ manufacturers. I hope this helps. As indicated in my vintage wishlist, I’m still looking for a PowerBook Duo 2300c, in whatever configuration provided the machine works. If you have one and want to donate it, I’ll assure you it will go to a good home, and I will pay the shipping costs, of course. Thank you for reading!